RadiWarm® arrives ready for use, filled with specially treated water and fully sealed. They don’t require plumbing, flushing, bleeding or topping-up before, during or after installation. This ensures that the patented built-in boiler gives the same heat quality of a gas central heating system, but without the plumbing, pipe work or even a gas supply. Simply wall-mount the radiator onto special safety brackets, plug it into a standard British electrical socket and switch on. It’s as easy as that. A single controller can work with a number of RadiWarm Pipeless Radiators® (within a 10-12m2 radius). Separate controllers are recommended for upstairs/downstairs use. 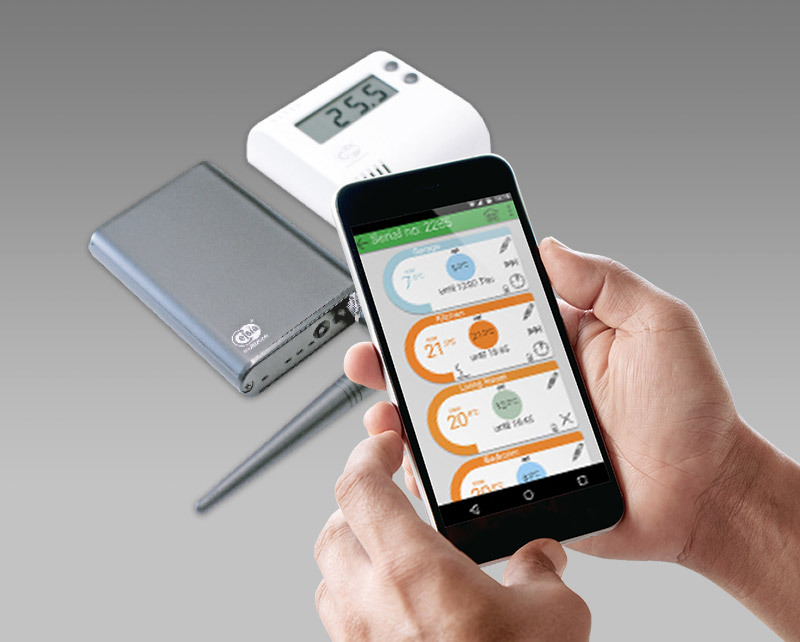 Thermostats – one required per room/zone (multiple radiators can be controlled by one zone thermostat. 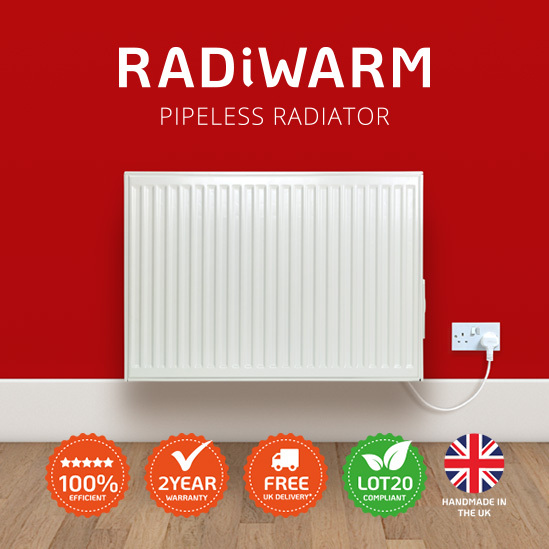 RadiWarm Pipeless Radiators® combine the heat quality of gas central heating systems with the simplicity of electric heating. Each water-filled radiator looks like a conventional radiator but hides an internal energy-efficient boiler and pump, transforming it into a self-contained heating system. The RadiWarm® is a true plug and play radiator. Mount it to your wall, plug it into a nearby standard mains electricity socket and enjoy the heat of a real water-filled radiator. 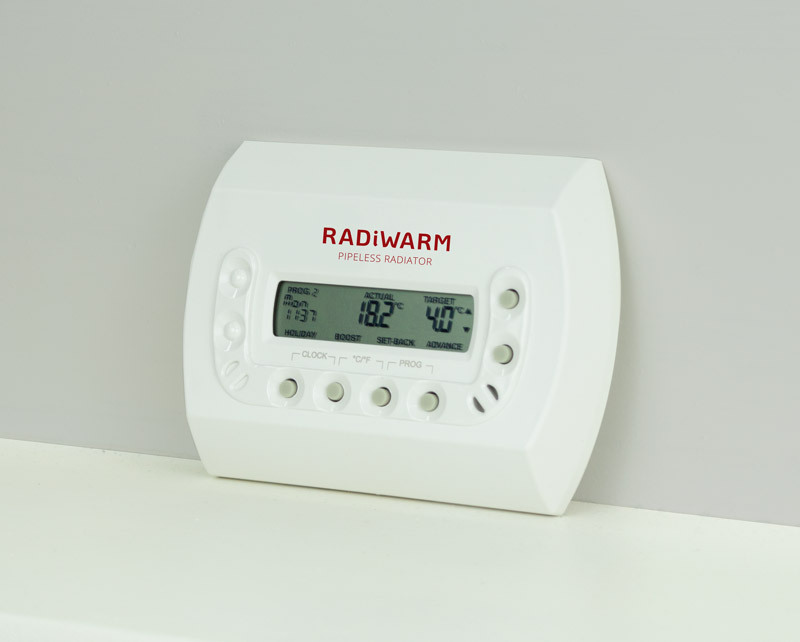 Or take advantage of our installation service where we will install the RadiWarm® for you. Where you may have children or vulnerable adults, the RadiWarm® Safe Touch gives the same quality of heat but with a protective low-temperature cover. Perfect for carehomes, nurseries, schools and public buildings – or in your own home.